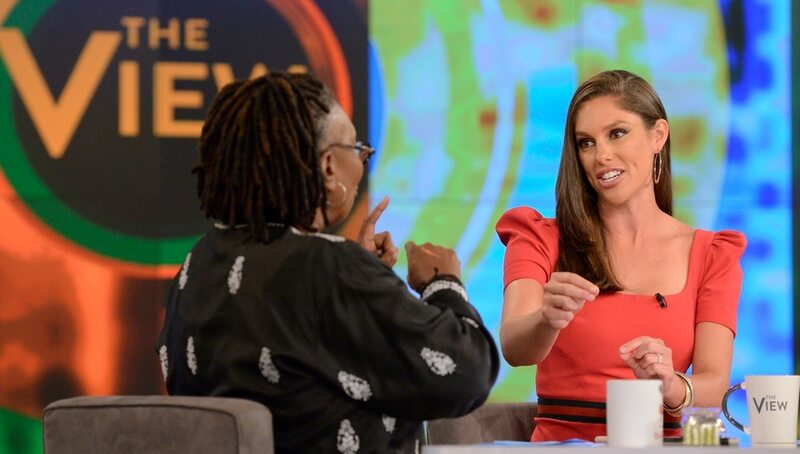 Abby Huntsman has been training for her new role on “The View” her entire life. She is, after all, the daughter of former Utah Gov. Jon M. Huntsman Jr., now the U.S. ambassador to Russia. Which prepared her to sit next to Whoopi Goldberg on the “View” panel Monday-Friday (10 a.m., ABC/Channel 4). Huntsman joined the show in the first week of September. Not infrequently, “The View” has made headlines when conflicts between panelists have gotten out of hand or have gotten personal. While she acknowledges that conflict is part of the formula of the daytime talk show, Huntsman sees that as a positive. “You debate to learn from each other,” she said. “We can disagree, and sometimes it can get heated. Sometimes it can be funny. Sometimes you can get emotional. You never know quite what's going to happen any given day. 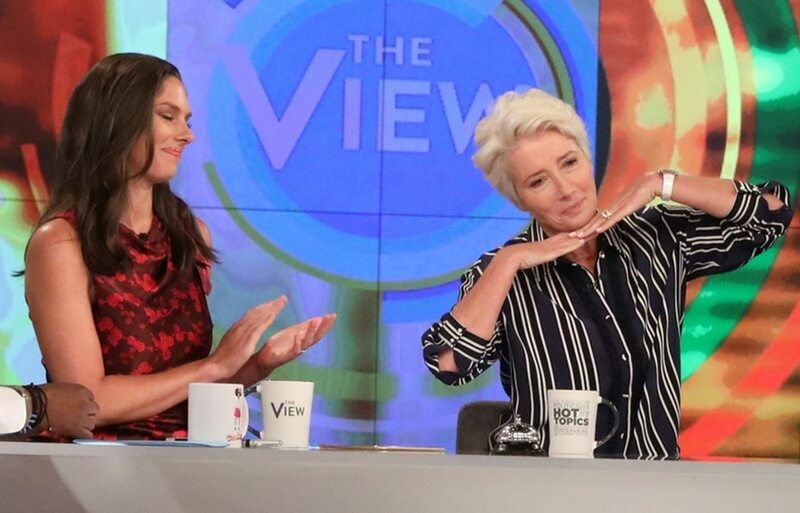 According to Huntsman, the “View” panelists “really do get along” — which is not to say they don’t disagree. “Sometimes in the morning meetings, it can get heated because you’re debating the stories you want to do that day and you can be on different sides. Sometimes I wish people could hear our morning meetings, and sometimes I’m really glad they don’t,” she said with a laugh. What watchers of “The View” are learning is that Abby Huntsman is not the right-wing ideologue they may have believed. Yes, her most recent job was anchoring the weekend edition of “Fox & Friends” on the Fox News Channel, but before that she worked at MSNBC and the Huffington Post. “I’m someone that is a pretty moderate person politically,” she said. “I might be more conservative than some of the panelists on the show, but you never quite know where I might fall. She’s certainly not afraid to criticize Donald Trump or to express conservative views unpopular with fellow panelists and the studio audience. Huntsman said Goldberg brings her life experience to the show. That approach matches the counsel she’s gotten from her father. “‘You’ve got to go be Abby,’ he said. ‘You are a happy person. Remind people of the sanity in this world,’” she said. With her father living in Moscow, “it’s tough because it’s Russia and everything’s recorded. You can only say so much on the phone,” Huntsman said. “He’s busy, but he’s watched a number of the clips that I’ve sent him. “And he’s honestly been so proud of me all these years. He said, ‘You know what? Don’t ever let me tell you how to be or what to say. Do you. Don’t feel pressure to speak for any group or family or political party.’ He’s been really big on that. When people ask Huntsman what it means that she’s a conservative, she tells them: “You’ve got to meet my dad,” she said. “He was the first [GOP office-holder], I think, in the state to support gay marriage. And he was all about clean energy. And those weren’t, at the time, conservative values. But at the same time, he was doing great things with the economy. As her father’s daughter, Huntsman can’t remember when she wasn’t in the public eye. She started acting in plays when she was 7 and continued through high school. For her father’s various governmental and diplomatic jobs, “we moved so many times in my life that you’re always the new girl. You’re always having to let people into your life and show them who you are. Huntsman said she’s been “fascinated” by journalism since she was in elementary school. Not when she interned at KTVX’s “Good Things Utah.” Not when she interned at ABC News in New York. “I really loved the producing side and the booking side, and I was fine doing that,” she said. Then she and her sisters became at least minor media sensations working on their father’s presidential campaign, which helped her land a job with HuffPost Live. Huntsman is doing a show that airs five days a week, but it’s a nice change from her last gig — anchoring the weekend edition of “Fox & Friends” for four hours on Saturday and another four hours Sunday. So doing a show that airs live at 11 a.m. ET seems almost easy. “The schedule is lovely, being a mom, because I can rush home to my daughter in the afternoon and have weekends with my family,” said Huntsman, the mother of 9-month-old Isabel. She bemoans thinking of the right thing to say two hours after a show has ended. Huntsman, her husband and her daughter are New Yorkers now; “The View” is produced in the city. But she said she remains a Utahn at heart. “I’ll always be from Utah,” Huntsman said. “Every time I land, I’m like — this is home. This where I was raised. … We moved around a bit, but Utah was always home base. And it’s such a good quality of life. I can’t tell you how many times I miss the wide-open spaces, the mountains. Editor’s note • Salt Lake Tribune owner and publisher Paul Huntsman is Abby Huntsman’s uncle.